Following health-conscious recipes filled with nutrient packed foods will contribute to the energy of your body and your mind. Healthy food doesn’t have to be bland, in fact, some of the tastiest flavors can be combined to create exotic fusions. Eat clean to feel clean! This island delicacy may appear complex and slightly intimidating to create, but it really is quite simple! The contents are fresh and raw, and require little preparation. *Shichimi Togarashi is a mix of spices and herbs including Sansho (Sichuan pepper), dried citrus peel, sesame seeds, poppy seeds, hemp seeds, ginger, garlic, shiso (Japanese basil), and nori (pressed seaweed). Most of these ingredients might already be in your pantry, but the rests should be available at your local Asian food supply. Begin steaming your rice of choice; I personally prefer jasmine sticky rice for taste, but brown rice has a bit more fiber. Whether you choose white or brown rice, you will still be consuming almost exactly the same number of calories, carbs, protein, and fat. Shred carrots into a jar. Whisk together shredded ginger, and rice wine vinegar and pour into carrots. Shake and refrigerate one hour to pickle carrots. 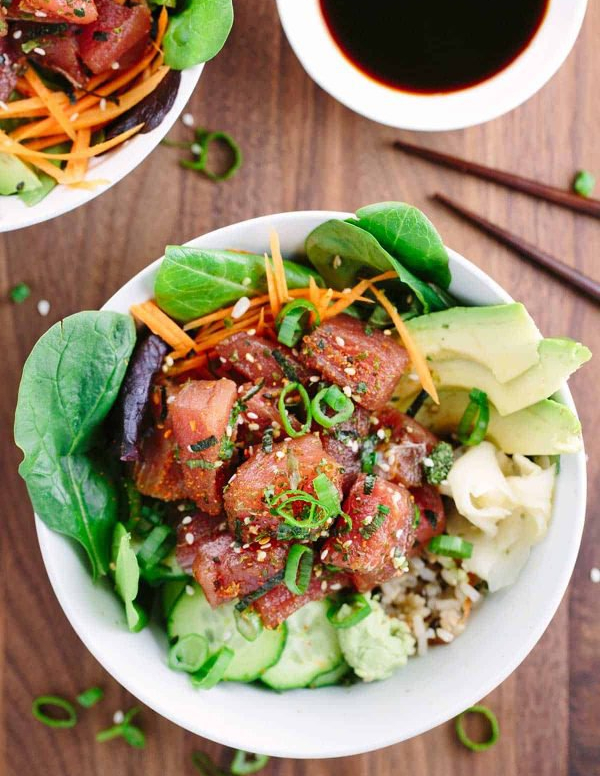 Cut the Ahi Tuna, Salmon, or Tofu neatly into 1/2-inch cubes, and place into a bowl. Stir in soy sauce or Tamari, sesame oil, Dijon mustard, rice wine vinegar, cayenne pepper, minced shallots and garlic, and chopped green onions. Refrigerate while you prepare other ingredients. Fill the bottom of your bowl with your rice of choice, and top with freshly minced cilantro and basil, diced avocado, the pickled carrots, grated ginger, and thinly sliced cucumbers and radishes. Scoop the tuna, salmon, or tofu on top, and garnish with Shichimi Togarashi and green onions. Check out another delicious and simple healthy recipe for a Thai Cucumber Salad!